OGT News | "Northern Crossings"
Mercy work needs an influx of volunteers and helpers and donators because needs never end. When people say that certain types of mercy work should be over and completed I remind them people get hungry at regular intervals during the day, and human being are liable to get sick occasionally and orphans are orphans, well, as long as they live. Anyway one of the great success stories is the Orphan Grain Train. 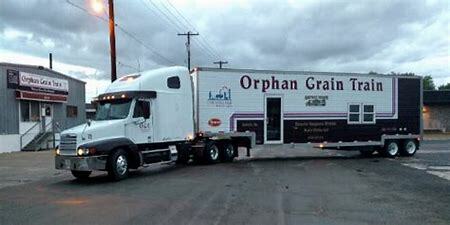 We have Orphan Grain Train Organizations in Minnesota North and North Dakota. Here is an announcement of an open house and a dedication coming soon. Click the link. The North Dakota Orphan Grain Train Branch will be having an open house from 1 to 4 p.m. Saturday July 21. The public is invited to come and see what the Orphan Grain Train is all about. A dedication service will be at 2 p.m. Tours will be given before and after the dedication service. The Orphan Grain Train Branch is located at the old C.H. Carpenter Lumber building at 103 4th Ave. SE in Jamestown. Christ’s example as a servant and His love for us. The Issue of “Saying It Like It Is”. Giving and Getting the “Finger”.